This extraordinary bottle is so unusual in such a variety of ways that we can be reasonably certain that no other bottle like it was ever made. 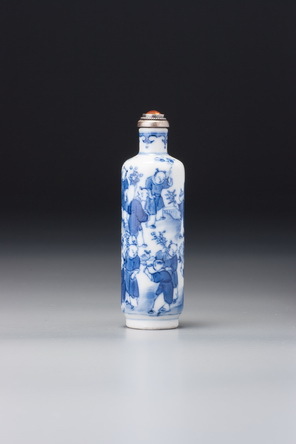 It is basically of the broad group of mid-Qing snuff bottles discussed under Sale 3, lot 82. It follows one standard for the group in its use of skin as a principal decorative language (although far from usual in being on both main sides rather than only one). The irregularity of one face on an otherwise essentially regular form and the tiny size of the mouth in proportion to the size of the lip are also typical, as is the excellent hollowing. Other rare features for the group are that it is further decorated with carving, is inscribed, has exceptional variation in the thicknesses of the two narrow sides, and is carved beneath the foot. Otherwise unknown for the school, however, is the free-standing relief at one edge, where the material is completely undercut, linking the main and narrow sides with openwork. The material is of a rather greyish colour, to the point of not even qualifying under the notably forgiving heading of ‘white’ nephrite. The skin, on the other hand, is both typical and delightful. It is even, rich, and well marked; moreover, the shape of the original pebble has allowed its use evenly on both main sides of the bottle. The art here is impressive. The carving is excellent, confident, and superbly controlled. Its greatest strength, however, lies in the imaginative conception. The material has inspired the artist to use its qualities to the fullest. By undercutting the bamboo plant, piercing it right through to the adjacent side, the necessary separation has been achieved to allow the whole of the rest of the skin on that side to act powerfully as a rock face by delineating only its left-hand edge and a tiny bit of the top of a crag at the upper neck of the bottle. A few leaves are then carved in front of this rock, while the main stem of the plant grows from just behind its base, giving depth to the otherwise very flat surface. The visual paradox between the perfectly defined rock and the almost wholly undecorated surface is a conceptual masterpiece. The unusual piercing leads the eye to the wider of the two narrow sides, where the bamboo is continued in what appears to be lower relief. In fact, it is much the same as on the front, where the visual games of the piercing of the main stem and the placing of some leaves in front of the rock prompts an illusion of much greater three-dimensionality to the entire plant than actually exists. Another rock face then frames the bamboo between two rocks, the inner edges of each being all that is defined, which cleverly allows the rest of the bottle to function as the continuation of the rock. The two rocks also frame a neatly incised inscription. The second rock face is also cleverly used to disguise a slight but obvious flaw in the material. On the other narrow side, the orchid is uprooted, its roots dangling down onto the outer footrim, which hints at more below and tempts one to turn the bottle upside down to look. The reward for doing so is one of the more impressive cases of carving continuing beneath a formal foot in the art form. It is, again, the conception that is so impressive. The prunus has been superbly thought out and placed, with an intriguing balance of languages in which the fully rounded carving within the footrim becomes simple incising as it continues onto it. The edge of the rock of the main design is also picked out in this simple incising. A final touch of genius is found in the fact that two tiny elements of the budding prunus extend beyond the confines of the outer footrim and emerge beneath the main plant of the bamboo. From the base view, they lead the eye back to the main design again, completing the visual cycle represented by the complete work of art. From the main side, they function quite naturally as pebbles at the base of the bamboo, so that one is not tempted to turn the bottle upside-down until the main surfaces have been absorbed. The inscription refers to the bamboo and chrysanthemum, which are symbols of moral integrity. The bamboo remains unbroken by bending under wind pressure or the weight of snow while the chrysanthemum, an autumn flower, retains its freshness and fragrance despite the onslaught of wintry weather. Both are metaphors for the scholar-official and the difficulties of maintaining personal integrity in often corrupt official service. The prunus carries a similar meaning since it flowers in adverse, winter conditions. The orchid is also a symbol of the scholar-gentleman and, uprooted as it is here, is a long-standing symbol of subtly expressed but vehement disapproval of a barbarian yoke on the Chinese culture (see Moss, Graham, and Tsang 1993, no. 31). Although from a time when the Qing dynasty had been in control for at least a century and possibly two, this hidden resentment of the Manchu rulers would have carried its intended meaning as it was passed from hand to hand among those loyal to the Han (pure Chinese) tradition.